My husband often jokes that all you ever have to do to get me to try a recipe is put “chai” in the title. I love anything chai — something about the unique combination of Indian spices just hits the sweet spot on my palate. I was planning to make my regular pumpkin cookies for a teacher luncheon this week, but got a 2am-can’t-sleep bright idea to infuse the glaze with chai tea. For once, I’m so glad I couldn’t sleep. The chai infusion was a very good idea. 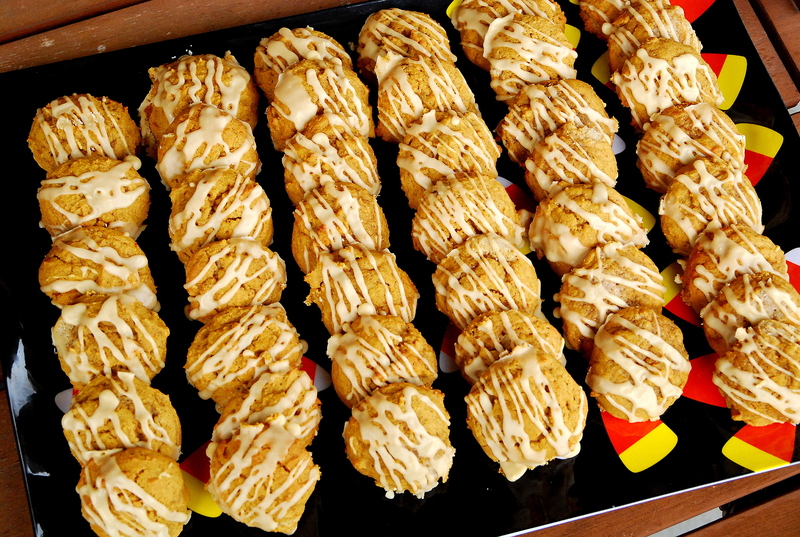 These are a perfect fall cookie. I prefer them small — if you make them too big they don’t flatten as well and sort of look like scones. 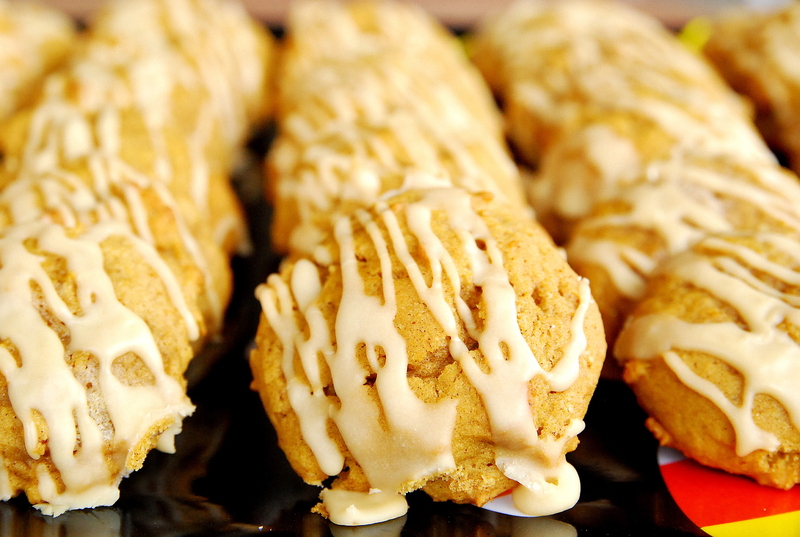 Be aware that, like most pumpkin cookies, these are soft and tender — don’t expect a crunch from these babies. And whatever you do, don’t skip the chai glaze! I prefer to keep these cookies on the small side, so yield the tablespoon measurement carefully. If they’re too big, they kind of puff up like a scone. Preheat your oven to 350°. Combine flour, baking powder, baking soda, spices, and salt in a bowl and set aside. In a separate bowl, cream together butter and sugars. Beat in pumpkin, egg, and vanilla until creamy, then mix in dry ingredients until well-combined. Refrigerate dough for at least 30 minutes. When ready, drop level tablespoon-sized balls (note: this is not very big) of dough onto a parchment or silpat-lined baking sheet. Bake cookies for 11–14 minutes, or until they begin to have just a hint of golden brown around the edges. Remove from oven and cool completely before glazing. For the icing: Melt butter in a saucepan and add milk. Steep chai tea bag in the liquid for 5 minutes, then discard. Stir in vanilla. Add liquid to confectioners sugar and mix until a smooth icing forms (add additional milk if needed to thin). Drizzle cookies with glaze. Store cookies in a single layer or they'll stick together. I leave them right on the counter and just lightly cover with foil overnight. I made these cookies for 3 parties in the last week (2 Thanksgiving meals, 1 Friendsgiving) and they were a huge hit at all 3. I followed the recipe exactly as it’s written. People were packing up cookies to take home before others could get to them, and several others asked for the recipe. Even people who normally don’t like pumpkin we’re fans.. I will definitely be making these again!